Discover the lush waterfalls of Ourika Valley and Setti Fatma on this private 7-hour trip. The day trip to the Ourika Valley is a popular attraction due to the numerous waterfalls and the wonder of nature that is at your fingertips. Despite being so close to the city of Marrakech, this beautiful and lush green valley is definitely one of the best preserved valleys of Morocco. Your day trip to the Ourika Valley starts at 8 in the morning at your accommodation in Marrakech. After picking them up at the hotel or riad where you are staying, we will go to the High Atlas, where you will be able to enjoy the way of life of its inhabitants along its steep roads. While we walk through the amazing landscapes of the Asni Valley, we will take the opportunity to stop at some of the traditional markets of the towns on the route, such as Asni or Aghbalou. Crossing the course of the Ourika River you can admire the landscape of the High Atlas, completely different from that seen in Marrakech. 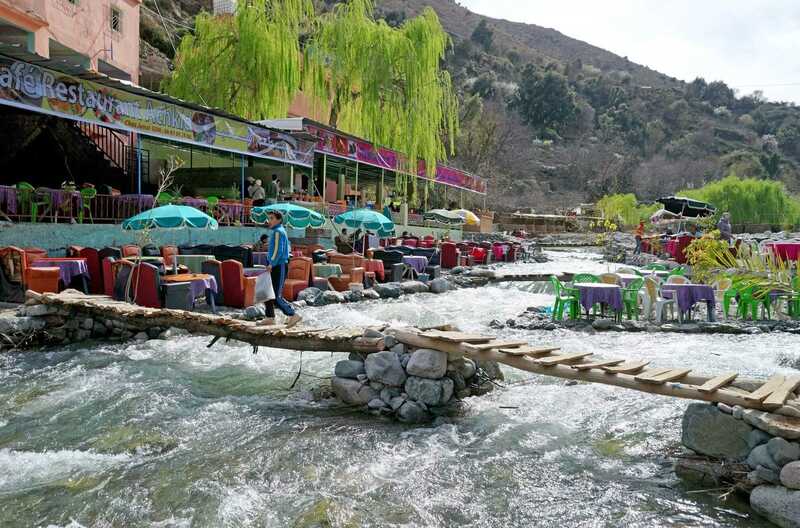 Once in Ourika you will have free time to walk through the valley, eat in its traditional restaurants or take a walk of one or two hours to then visit the waterfalls of Setti Fatma. We will be back in Marrakech around 5:00 p.m.
Setti-Fatma: A small town from which you will depart to visit the waterfalls of the Ourika River. Cascadas del Ourika: The most important point of the excursion. Obligatory for all nature lovers. Typical Berber house: An approach to the traditional Berber life of the mountain villages. The Berbers have always been excellent hosts. But do not believe us blindly, check it out for yourself! Traditional markets: Area of special interest for its colors, smells, flavors, lights and people, where craftsmanship and ancestral customs are intertwined.